As we planned, we left Ninilchik somewhat early because we had a lot of driving to do in order to see everything we wanted to see and get Jeff to the airport. We started by going the additional 30 miles south to Homer. We went out on the split and did a quick driving tour of the town. Homer is known as the halibut fishing capital of the world and is where fishing tours depart. It is also the jumping off point for most fly-in bear tours (Brooks Falls, Katmai) so the split is pretty much a tourist mecca with tour company after tour company and a few shops and restaurants in between. Although I would certainly love to do either of those activities, the price is pretty prohibitive so we will have to be content with our bear watching in Hyder... which I am more than happy with. All in all, I didn't feel that we were missing out too much by not spending more time in Homer. I'm sure others would disagree with me. We then made a bee-line to Seward so that we could visit the Alaska Sea Life Center and its' current adorable resident - a 7-week old rescued walrus. 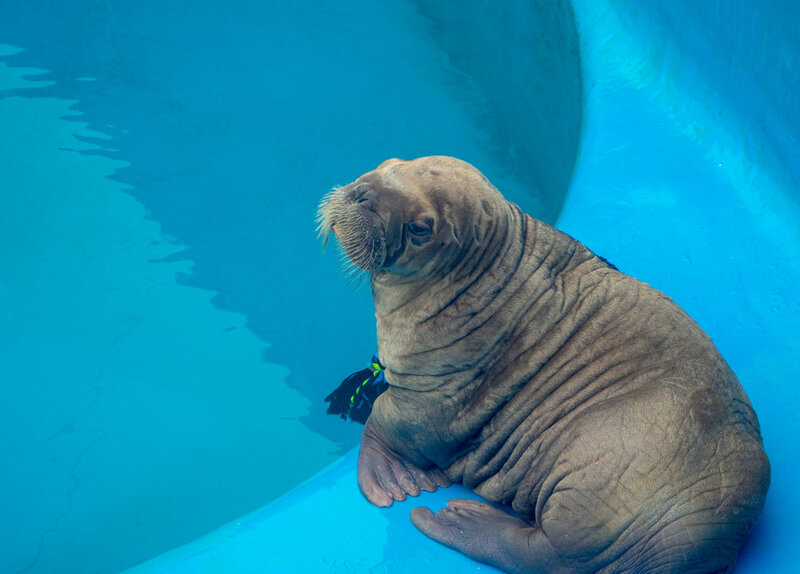 As some of you know, my daughter Ricki is a marine mammal trainer at the Indianapolis Zoo and she has been helping to raise a rescued walrus named Pakak who they got (through the Alaska Sea Life Center) several years ago. Because of this, we have a special spot in our hearts for these endearing marine mammals. This newest rescue will eventually be moved to a zoo or aquarium in the US and, since there are only 8 facilities that are capable of housing a walrus, he might end up in Indy. As you can see in the photos, he is super cute and we enjoyed seeing him and all of the other animals at the Sea Life Center. It is a very impressive facility and is doing great work in rehab and research. We had a late lunch at a Seward institution called Thorn's Showcase Lounge - a place that kind of defies description (think curios everywhere and plush leather everything). Jeff had their specialty - a bucket 'o buts - which is fried halibut chunks, and said it was really good. Not being a seafood eater, I had a hamburger which was so-so. We drove back to Anchorage without incident and got to the airport in plenty of time. Jeff got off and I went to the Anchorage Cabela's for the night. It was a little bittersweet - on one hand, I was happy to have my van to myself and I do enjoy the freedom that comes with traveling solo. But it was nice to have someone to share the amazing sights with. I was looking forward to taking a day to get going on the blog so the next day I camped out at a Starbucks. One thing I knew I wanted to plan for was a boat trip out of Seward into Kenai National Park. I checked the weather forecast and discovered that the weather was supposed to be great all weekend in Seward so I booked a ticket for Saturday on the 9-hour Northwestern Fjord tour with Kenai Fjords Tours. Because the tour left at 8:30 am, I figured I'd take a leisurely drive back down the peninsula the next day (Friday) in order to be in town the night before. I spent another night at Cabela's and set out toward Seward the next morning. It was a beautiful, sunny day and I just meandered along. It was wonderful. Be prepared for a barrage of photos in the next post - the boat tour was awesome and definitely a highlight of the trip so far! There will even be a video of a huge chunk of ice calving off of a glacier!